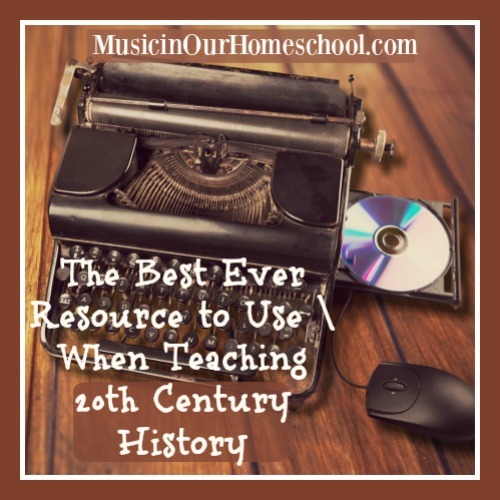 Two years ago my kids were studying 20th-century history and I knew they needed to include music history with those studies. I began researching during the summer and taught a 20th music appreciation course at our Tapestry of Grace homeschool co-op during that year to grades K-12. Now, I have transformed it into a self-paced online course called 20th Century Music Appreciation for High School. It’s the best ever resource to use when teaching 20th-century history. What is special about the 20th Century Music Appreciation course? What do you learn in the course? Here are a few of the composers/styles you’ll learn about. See the whole list and preview a couple of lessons over at Learn.MusicinOurHomeschool.com. Why Study Music Appreciation alongside 20th Century History? The arts, including music, drama, art, and story (books and movies) are always affected by the events surrounding their creators. Historical events in the 20th century led composers to write in new styles. In the online course, you’ll learn about the folk songs of the 1960s which were written in protest to the Vietnam War. You’ll hear new styles of opera and ballet that were set in modern times, making them vastly different from their predecessors in the previous centuries. Brand new genres were created such as movie music. You’ll also learn about how historical events affected the composers themselves, causing them to write in a particular manner–such as those who feared for their lives under the tyrannical regimes in Stalinist Russia and Nazi Germany. I can’t think of a better way to learn about history than to listen to the music written during the times while studying it.